Thirty years after the end of the genocide, the trials of Khmer Rouge leaders are providing hope that justice in the courtroom may bring a sense of healing to the people of Cambodia. Nevertheless, the violence of the past lives invisibly on. Cambodia is one of the most heavily mined countries in the world. Memories of the atrocities thirty years ago thus live on; both in the minds of survivors and in the land itself. Choun Sath was born in 1950 in Prey Veng Province. In 1972, a landmine blew up in front of her home, and as her husband tried to help her, he stepped on another mine and was injured as well. Now she lives alone with her grandson, whose studies inspire her hope for the future. He is young, but already achieving grade 9 levels in math, physics and chemistry and often studying until 10 at night. When she thinks about the past, it’s very difficult for her; she had to struggle for her life, and now she has to struggle for her grandson’s. She doesn’t talk to him about the past; instead, she encourages him to study for his future. Heang was born in Siem Reap province in Cambodia. She grew up with five brothers and sisters, and when she got married, she had five children of her own. When the Khmer Rouge came to her village, she was separated from her parents and siblings, who were all burned to death by the Khmer Rouge. She was again separated from the rest of her family when Pol Pot’s people forcibly removed her to a commune, where everyone had to plant rice under threat of death. She considers herself lucky; there was a group in her commune that “adopted” her, brought her into their silent circle of kindness. Kindness and personal allegiances were punishable by death, and she and others who formed this group of friendship had to steal time away far out from the fields in order to talk. If a soldier saw them going out away from the fields, however, they would put a gun to their heads and say, “Where are you going?” This happened often, and happened to Heang. After the fall of the Khmer Rouge, Heang became a soldier because she wanted to fight the people who killed her family. Her parents were killed, all five of her siblings were killed, her husband and their five children were killed. 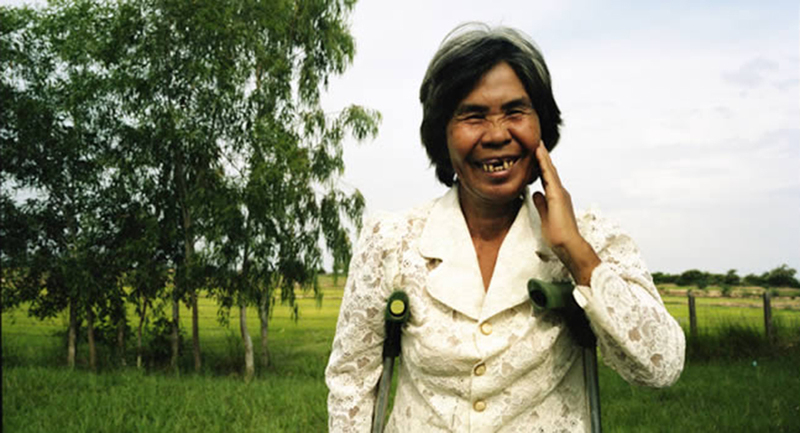 In 1983, on a Tuesday at 12 o’clock in the afternoon, Heang stepped on a landmine while walking with her fellow soldiers. Life only got harder for Heang, who went to live with her grandmother, who was kind and loving, but Heang’s aunt and uncle lived with her grandmother as well, and they didn’t let Heang stay long. Now she is learning to make silk handicrafts and trying to rebuild a sense of community with other survivors through the Cambodian Handicrafts Association in Phnom Penh. She continues to want to fight the Pol Pot people who killed her family. She says the trial of the five Khmer Rouge leaders that began this year doesn’t matter; in her heart, she wants them to be killed, as they killed so many. After Sok Vany lost her leg to a landmine as she was working in the fields, her husband left her and their three children, and Sok Vany didn’t want to live. Through Veterans International she received support in raising and selling pigs, which in turn enabled her to buy a sewing machine. Now she’s a self-taught seamstress who takes pride in her work, loves the color purple, and hopes to one day have a machine on which she’ll be able to make wedding gowns. During the Pol Pot regime, Yim Rin and her sister were taking a cow to work the fields when her sister stepped on a landmine and disappeared. A fragment of the mine was embedded in Yim Rin’s leg, and local treatment was costly and ineffective. The injury became infected and she had to go to Phnom Penh to have her leg amputated. Without a prosthetic, Yim Rin had to crawl to meals on the commune she worked under the Khmer Rouge, and by the time she arrived, little rice would be left. After the Pol Pot regime, her parents arranged a marriage for her; she had two children with her husband, but he drank daily, didn’t help her work in the fields, and was an emotionally destructive force in their home. She asked him for a divorce, and now she supports her two sons, 8 and 12, alone. With assistance from the doctors at Veterans International, she is able to get pencils and clothing for them for school, but food is still a daily struggle. Photographer Nura Qureshi and writer Nicole Pombier Berger met and interviewed these women in the summer of 2008, in Prey Veng and Phnom Penh. Thanks to the Cambodia Trust, Veterans International, and the Cambodia Handicraft Association who work to help survivors live and work with dignity.